A white, translucent odorless hydrocarbon wax that is chemically inert and odorless. Paraffin was first produced commercially in 1867 as a refined petroleum product composed of a mixture of saturated straight chain hydrocarbons (C22-C36). Production consists of separation by distillation followed by chemical treatment and decolorization. Synthetic paraffin wax made from coal products was introduced after World War II. 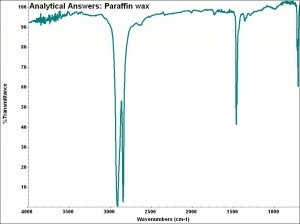 The snow-white synthetic paraffin is harder and purer than petroleum-based paraffin waxes. Paraffin is used to make candles, wax paper, leather dressing, inks, lubricants, cosmetics, and sealing materials. The wax is also used for heavy-duty floor wax, waterproofing textiles and paper, tanning leather, as rust preventives, and for masonry and concrete treatment. Microcrystalline wax is a special refined grade of paraffin wax. Soluble in benzene, ligroin, carbon disulfide, olive oil. Combustible. Flash point = 204C (399F). Encyclopedia Britannica, http://www.britannica.com Comment: "Paraffin Wax." Encyclopædia Britannica. 2004. Encyclopædia Britannica Premium Service. 14 Apr. 2004 . This page was last edited on 26 April 2019, at 05:45.